Yesterday marked the decade anniversary of the release of “Cloverfield.” It was in 2007 that Bad Robot unleashed an amazing and painfully addictive viral campaign for what was essentially a modern giant monster movie. Taking to the internet as the primary tool, fans speculated for over a year what “Cloverfield” was from theories about a Cthulhu apocalypse film to “Voltron,” and fans even created their own monster designs for what the monster would and should logically look like. There was even a mysterious online game that had zero to do with the movie but capitalized on the mystery, nonetheless. “Cloverfield” ended up being a wonderful film, and the start of an anthology movie series that involved human struggle, a mysterious marketing campaign and a giant behemoth of some kind. With “Cloverfield” now a decade old and two more mysterious movies from the series coming very soon, I look at five reasons why the movie is still so fantastic. JJ Abrams has a lot of work to accomplish with “The Force Awakens,” removing the stigma and stench the series has accumulated over the years with the release of the “Star Wars” film prequels, the constant re-editing and changes to the original films, and so much more. “The Force Awakens” actively works as a rebuttal to the aforementioned legacy set, unleashing a film that’s very down to Earth and celebratory of the original trilogy as a whole. It not only musters up a lot of the tropes from the original trilogy, but acts as a launch pad for a massive movie series that Lucasfilm and Disney are planning for a very long stretch. While some have criticized the film for recycling some elements from “A New Hope,” Abrams fully understands what he’s working with, and working on, and uses “The Force Awakens” as a massive doorway accessible to literally anyone. If you’re like me, you enjoyed “Cloverfield” a great deal and were shocked to see its spiritual sequel sneak up on America one day in February of 2016. It’s definitely a spiritual sequel in every way in the same idea that “Halloween III” was a spiritual sequel to “Halloween.” Director Dan Trachtenberg supplies a steady stream of surprises without ever really making audiences feel cheated. “10 Cloverfield Lane” is a masterful dramatic thriller that asks the big questions about survival. Its biggest themes about the setting feels like something out of a random survival website to arouse conversations. If something was going down in the real world, would you go outside and brave whatever was waiting for you, or would you live in a bunker with all the supplies and luxuries, but have to be under the watchful eye of a very unhinged individual who may or may not be lying to you? What hell is more managable? After many years of the “Star Wars” franchise remaining stagnant and relatively convoluted, “The Force Awakens” has come to simplify and completely re-think the movie series. JJ Abrams introduction to his bold new vision for “Star Wars” is a one hundred percent faithful visit to a galaxy far, far away that functions as a platform for a new series, a sequel, and a love letter to the simpler, episodic days of “Star Wars” where every film was an ode to the classic movie serials of the golden age of cinema. This time around “The Force Awakens” actively works in fixing many of the mistakes made in the original six films, by actively casting a wide array of heroes and villains to present a more humanistic environment we can dive in to. And I’m not speaking about a wider array of aliens, but racially diverse characters, all of whom have something to contribute. I’ve never been much of a fan of “Star Trek” as personally I’ve always found the intelligence vastly oversold by zealous fans, but I digress. I’ve spent most times admiring the light saber than I have the USS Enterprise and I think JJ Abrams has found a great balance where even folks who have written off the franchise can enter with a clean palette. And that’s not easy considering the Trek has lost its punch over the last ten years with a waning film series and television stake. 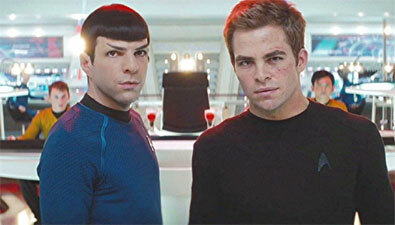 “Star Trek” is a film that reboots the aforementioned franchise with all of its guns loaded as it looks to not only show what becomes of James T. Kirk and Spock but who their parents were and how they lived as soldiers of the Star Fleet. We live in an age where we’re always watching someone. Cameras watch us, guards watch the cameras, surveillance videos keep an eye on potential criminals, we watch people on web cams, we pay to watch women undress for us, we peer into celebrities’ lives through tabloids and candid cameras, we watch reality shows built around surveillance cameras and hidden video, and we’re constantly being watched by our government who keep us monitored and at close range, so it was only natural that horror movies would grow to reflect that. “Cloverfield” is one in the “Blair Witch” formula that doesn’t try to give us a film, but more purports to give us actual home videos through the eyes of average upper class New Yorkers and keep us watching through a camera lens. Through this camera, we are the voyeurs.